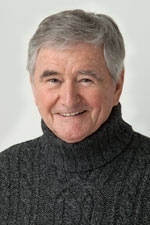 James Quinn is an award-winning composer/lyricist/pianist who has created a large body of unique works for theater, televison and the concert stage as well as a large body of individual songs and chamber works. He is best known as the principle composer/ associate lyricist of the smash hit musical "DO BLACK PATENT LEATHER SHOES REALLY REFLECT UP? ", (Forum Theatre, Chicago) (Birmingham Theatre, Detroit) (Walnut Theatre, Philadelphia) (Alvin Theater, New York). The work holds performance records in Chicago, Detroit and Philadephia and is still consistently performed over 30 years after its premiere! Other theatrical works for which he wrote both words and music include the youth-musical "DOUBLE TROUBLE", the musical comedy/review "BODYPARTS", the opera/oratorio "JENNIFER'S CROSSING" and the cabaret musical "3 DIVAS ON SOME OFF-NIGHTS". He is also known as the composer/librettist for several breakthrough television works, including the Emmy Award and Blue Ribbon Citation Award-winning opera-ballet "REQUIEM FOR A SLAVE" and the jazz-ballet (with narration) "RITUAL-D", both of which were broadcast on the PBS Network. He also created the theme music for "HUMANITIES THROUGH THE ARTS" a 12 program educational TV series with Maya Angelou as narrator. Among his works for the concert stage are "SHOES - A SYMPHONIC SONG SET" and "RHAPSODY FOR PIANO AND ORCHESTRA" (on a Theme for Saint X), both of which were premiered by the Chicago Symphony Orchestra with the composer as conductor and solo-pianist respectively. His "ECHO SONG FOR PIANO AND ORCHESTRA" was premiered by the Chicago Chamber Orchestra with the composer as piano soloist. His "PORTRAIT OF THE LAND' won the American Bandmaster's Association Ostwald Award for Best Band Composition of the Year making JamesQuinn (then writing under the name J. Mark Quinn) the youngest composer ever to win that coveted prise. Another of his band works, "CHORALE OF THE WINDS" is still being performed more than 40 years after its publication. Quinn's "REVOLT: RED-1" was broadcast throughout Hungary on Hungarian National Radio as part of the commemoration of the 35th and 50th anniversaries of the 1956 Hungarian Revolution. His chamber music, songs and other works in various media have earned him over 44 consecutive awards from the Popular Awards Panel of the American Society of Composers, Authors and Publishers (ASCAP).